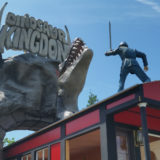 At Dinosaur Kingdom II, visitors will be transported back to the Civil War—with a prehistoric twist! Realistic, life size dinosaurs battle with Yankee and Confederate troops, altering history. Whimsical and interactive features will keep guests on their toes. Open thru Oct 31. Sat-Sun 10am - 6pm. Adults (13+): $10, Kids (3-12): $6. Located across from the Natural Bridge Zoo on Rt. 11.